From this historic document, freedom has become synonymous with liberty, patriotism, and all symbols representative of each. This article includes poetry of how I envision the feelings of the founding fathers in their passion for the creation of a constitutional government and my concept of freedom as expressed through writing and symbolization. I start with my vision of Jefferson as he toiled at his task of writing what I believe is the most important document defining America. The original draft of the Declaration was written by Thomas Jefferson from 11 June 1776 to 28 June 1776. It was finalized and approved by the Congress and printed on the evening of July 4th. The original document was signed by only John Hancock as President of the Congress and Charles Thompson, as the Secretary of the Congress. Other signatories were added beginning in August and were not completed for several months. John Hancock, waited in Congress for Thomas Jefferson to present his initial draft of The Declaration of Independence. Heat is a poem that describes what he must have felt in signing a document that made him a traitor and a patriot simultaneously. It is hot! The air above me suffocates, lacking breeze. This July eve, the heat affects me most. Tomorrow, I will end one affiliation and begin anew. but may not survive the coming storm. as a consequence of this nights decisions. I feel the heat began to crescendo into a firestorm. I envision myself appearing at the very gates of Hell. soon, this will be my home no longer. The document prepared by Jefferson beckons my signature. sign The Declaration of Independence. I realize this heat will not go away for a long time. I return to say goodbye. I wrote Freedom and FREEDOM as a statement of current events and the impact of the growing rift in the political and social structure of America. Although from different eras, both reflect the same basic virtues and beliefs. The American Flag is the most recognizable symbol in the world. Anyone, in any country, that sees Americas’ flag immediately knows what it represents. This poem reflects my belief that it is more than just a symbol. as in going into battle resounding victory. wherever seen America is found. a gentle giant to those who are represented. in reality it is you. Poetry is an association of words placed into structure, weaving majesty and brilliance to create text. History and the symbols that represent history have, long been expressed poetically. I find poetry a novel of verse lacking the novels long narrative, yet providing the same wonderfully exciting experience of wonder and fulfillment. War is the bane of society. Why do we fight? We do not depend on each for food, clothing, or shelter. Is there a reason for the enormous loss of life brought about through war? The only logical reason for war is population control. All animals in nature have a predatory counterpart that helps cull the sick in disease prevention, control the number of a species in maintenance of a healthy environment and of course as a food source. In nature, the process is well defined and executed…in other words; it works. This is not the case with man. We have no counterpart to control us. We therefore, are the control. Is there a genetic code buried deep within the soul of man that dictates war as a population control. Do we use land, ethnicity, resources, and power as excuses underlining the true role of war in human development? I have written the following poetry in my quest to find some justification for the madness of war. I begin with the question, what is war? preventing starvation in an overpopulated world. a depreciable asset in accumulated loses. What is war if not the end of humanity? Sensibility dictates, it matters not the definition, reason, or explanation of war. The determining factor often lies in the availability of personnel, economic wealth, industrial strength, and natural resources necessary to conduct war. Wars are fought more often for natural resources than with natural resources. Those who have not want, those who have, want more, therefore war. Personnel resources can usually be assured. Records and documents describing many wars and campaigns site reasons for men and women to come forth when history cries, and display the tears of sorrow shed with their realization of the impact and consequences of war. leave no doubt, who is on what side. soon bright red, confirm life’s ebb. tend all who breathe and may survive. All now quiet, both sides watch and wonder. a people unknown until they died. With the cessation of fighting and signing of terms that end the war, comes full realization of the economic cost for taking care of fallen warriors and those disabled physically and mentally. When wars end, for many, a far different life begins. disfigurement is its blind eye. I have no feet; I need no shoes. I have no hands; I need no gloves. No legs; no need to walk. No arms; I long for hugs. What is left, sits in a chair all day. At night, I turn in great pain. Some say I am lucky to be alive. As we age, we are enlightened and often reminisce over the actions of our youth. That period when we have no fear of death and there is a feeling of indestructibility. That is until the shooting begins and the body count makes men of boys; setting aside forever the fantasy of youth. Through age, comes the realization once again of death. We therefore anguish over our youth and will not rush to death in our twilight. If old men fought, wars could not be possible. I wrote this poetry in my quest to find some justification for the madness of war; I have failed. We will continue to fight wars and kill one another through ignorance. There is no honor in the predatory nature of man. Our biological classification as an animal, does not mean we must act as one. Nature did not provide us a natural predator and did not intend for us to prey on each other. We were given the intelligence to develop the means of controlling population and sharing resources without using war to satisfy the animal existing in us all. One day we may look upon each as what we truly are, family, not enemies. I write about all the various stages of love; defined by the length of a relationship regardless of longevity including, relations of our youth to love strong enough to survive the challenges presented throughout marriage. I define love as a cyclical process as related to generative grammar, through which we develop our relationships, either good or bad, to reach the ultimate experience of obtaining the realization of love over a lifetime. 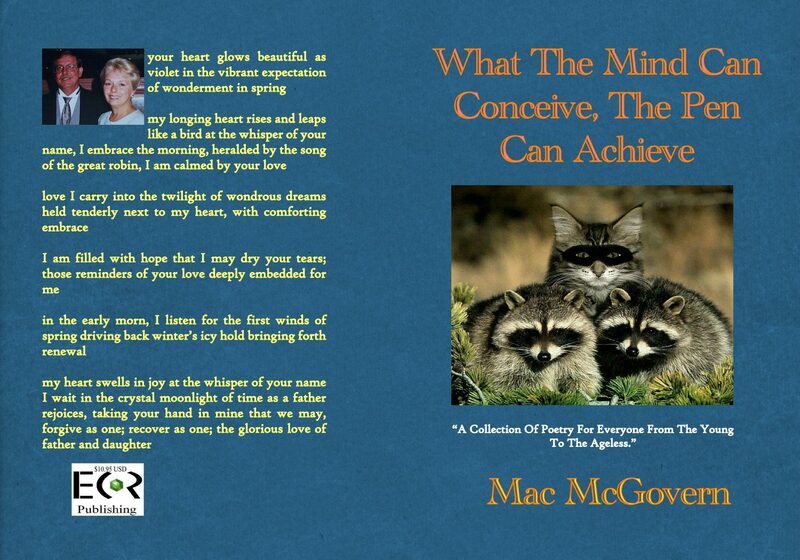 This poetic expression is written from my perspective and experiences. It covers a lifetime; a time span of all human emotion associated with feeling. The slant from which I write is male. The prevailing emotions surfacing, as you read, allow both male and female to insert their memories equally. Our trip through love, begins with what most of us remember as the first time we fell head over heels in love with the one who drove us out of childhood, to experience that “first time I saw you” emotion burned forever into memory. sending waves of your essence my way. by those who sing them. Once we move through the uncertainty of love, we may move into the lasting relationship we all crave. A relationship that is mutually bonding; providing a deepening of love inspired by greater understanding, and mutual satisfaction lasting through life’s remaining days. This stage may complete early in relationships or take years to realize. The most amazing event in life is the delivery of our children. One of the few times a man can cry, be congratulated, and hugged by friends without embarrassment. Children require a lifelong dedication for their welfare and guidance in preparing them for the challenges and obstacles they will face as adults. My favorite time is watching children grow, mature, and begin their lives as loving reproductions of the parents. When love reaches the age of contentment, we settle into a life of joy accentuated by spending the rest of our lives together. Other than losing a child, there is no greater pain than losing the love of your life. Yet, we each continue our journey, remembering the life we spent together. Those who believe are consoled in knowing soon they will be together once again. instilling love day and night. opening her arms to hold me tight. her loss a burden, I need not have feared. he was passed away from her. Finally, we come to the “greatest honor” bestowed upon parents. the best of what they were. Love is the one constant that survives through the ages. It also, is the constant providing every emotion from pure joy, to hate, to unrelenting remorse. Through all its success and faults, love remains true as the only constant ensuring our future.